RV: I am grateful to have many opportunities to teach yoga. I teach group and individual classes weekly in the Tampa Bay area I also teach a variety of workshops and provide instruction and mentoring in the Yogi Teacher Training program at St Petersburg Yoga. In the last few years I have really enjoyed teaching yoga retreats in Costa Rica, as well as locally in the Tampa Bay area. Because I am originally from Colombia, South America, it is also important for me to maintain a connection with yogis there, so I also teach a variety of workshops in Bogotá at least once a year. What type of yoga do you specialize in? Authentic Yoga, focused on facilitating the transition from pain, stress, and restriction towards well-being, calmness and greater freedom. Drawing on a variety of yoga tools and techniques, I customize each class according to the needs and circumstances of my students. Every week I teach a range of group classes, which include gentle restorative, therapeutic, mindful flow, slow flow, pranayama, meditation and yoga nidra. Offering a variety of class types ensures that students will have choices for the style of practice that will be most beneficial for them at any given time. In general, the group classes I teach include a combination of practices for the mind, body, breath and heart. RV: I started practicing yoga regularly in 1996. Not long after I began practicing, friends and family members noticed my enthusiasm for the practice and wanted me to share with them what I was learning. That is when I started teaching individual sessions. In 2005 once I enrolled in teacher training certification, I started teaching group classes in formal settings. 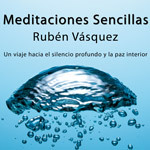 RV: Believe it or not, I went to my first Yoga class in Colombia in the late 1980s with my grandmother and my parents. My grandmother use to go to Yoga classes twice a week for years. My first class included asana, pranayama and guided meditation. I returned a few times, and every time I enjoyed the practice greatly. However, it was only a few years later, while living in Chicago that I felt the need to start practicing yoga, partly due to some back pain but also because I felt I just needed it. 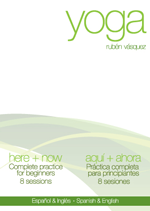 I bought a small paperback about Yoga and started practicing at home every day. Although my body was very inflexible the practice felt like meditation in motion. Each time I practiced, I felt centered, relaxed and energized. Since then, I haven’t stopped practicing. RV: Once I started practicing yoga daily, my practice set the tone for my day. The silent early morning yoga practice gave me a deeper perspective on the ebbs and flows of my daily life. As I continued practicing and feeling greater clarity, my commitment to the practice grew and Yoga became the element that was always a part of my day, even while I was working and attending graduate school full time. Yoga became my foundation, influencing my ways of thinking, moving, feeling and interacting with others. After living in different countries and different parts of the U.S., my wife and I moved to Tampa in 2005, and thanks to her unwavering support I was finally able to enroll in teacher training and to start teaching yoga full-time in this area. For the last 7 years, I have been fortunate to spend most of my time learning, living and sharing the yogic life and my interest and passion for this transformative practice. Is it possible to get injured practicing yoga? RV: Like any other activity, Yoga, when it is practiced without awareness can lead to injuries. Earlier in my practice, several times I allowed my ego to get ahead of myself and I would try to achieve “more” in a posture than what my level of ability allowed for. Lucky for me, I only had to deal with minor injuries or a strong headache from using pranayama incorrectly. Yoga is a powerful practice where we are asking our bodies, minds, heart and breath to reach their potential, to grow out of patterns of limitation and constriction. This is why it is so important to use these tools with intelligence, respect and sincerity to ensure that the practice is appropriate and beneficial. RV: As a Yoga teacher, every day I offer my knowledge and experience to try to meet people where they are as they move towards greater stability and clarity. The greatest reward in teaching is to see fellow yogis with less pain, restriction and agitation. It is a beautiful, heartwarming experience! In your opinion, what are some of the benefits of yoga? RV: Yoga helps us live our lives more fully by bringing our body, breath, mind and hearts to function with less constriction and less pain. Yoga offers us tools to calm our minds, something that is much needed in our busy multitasking times. It helps us improve the way we breathe so that we have more energy and can get rid of toxins. With yoga we learn to use our bodies with intelligence and grace as we learn to open our hearts and our minds to feel and perceive with greater clarity the wonders of life and the world around us. RV: When I first started practicing yoga, NONE of it (the postures and movements, the ways of breathing, the concentration and meditation techniques, the chanting) was easy for me! I found all of these aspects of yoga to be very challenging. However, as I gradually started entering into the experience of being fully present in my own body, mind, heart and breath, I was able to get a glimpse of true peace and freedom. By practicing consistently I have witnessed the many unhelpful patterns that I had cultivated over the years: in posture, movement, breathing, thinking and feeling. Some of these patterns, like tendencies toward anxiety, perfectionism, and isolation, are kept in check through my consistent practice. Most of all, I feel that yoga has given me the mental, physical and emotional energy to live a fulfilling life with more love, kindness, and compassion towards myself and all other beings. What top three qualities should someone look for in a yoga instructor and studio? RV: Look for an instructor who is balanced, calm and clear in their actions, words and instruction. In a studio, look for a place that provides a safe space with minimal distractions where you can be guided with confidence to practice wholeheartedly. RV: Try a class, breathe deeply, don’t hurt yourself and allow yourself to enjoy the experience. There are many styles of teachers and practice out there, and it may take some time to find a style that resonates with you. Once you find the style that works for you, practice with patient persistence, knowing that you have your whole life to practice. You wrote that “yoga is being present.” Tell me about what that means. RV: Thousands of years ago a sage named Patanjali defined yoga as restraining the noise in our system. Most of us spend a lot of time thinking about the past and the future. Quite often those thoughts create regret and nostalgia for the past and anxiety, excitement and/or fear for the future; this is the noise that Patanjali was talking about. As we get wrapped up in those emotions we tend to forget that the only moment when we can act and be effective is in the present. Although many people think that Yoga is about flexibility or about getting our bodies into spectacular postures, the physical practice is only a small part of Yoga. The most important aspect of the practice is awareness and awareness only happens in the present moment. It is not a coincidence that most Yoga tools center on the breath. Since the breath happens only one at a time, right here and right now, the breath is an excellent vehicle for awareness. When we focus on the breath we redirect our energy from attention to past or future to present moment awareness so that we can deal effectively and with clarity with our current situation. All of the Yoga tools and techniques are geared towards bringing us to participating fully in our here and now situation; this is why Yoga is being present.